An artist's imagining of ostrich-mimic theropods: "Ostrich Guys"
Skeleton of the small oviraptor Khan from the Late Cretaceous of Mongolia. The short, deep skull bears a parrot like beak. 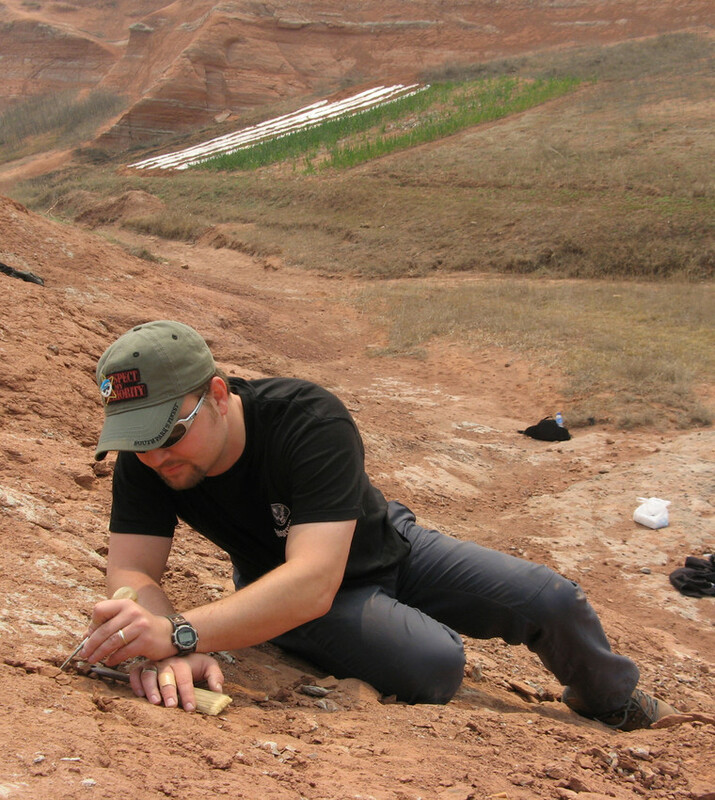 Peter Makovicky digging for dinosaur fossils. For most of us, Big Bird is about as big as it gets when it comes to our feathered friends. But for Peter Makovicky of the Field Museum, Big Bird is small stuff. A couple years ago Makovicky and Lindsay Zanno of North Carolina State University did a study showing that many theropods are actually vegetarians. 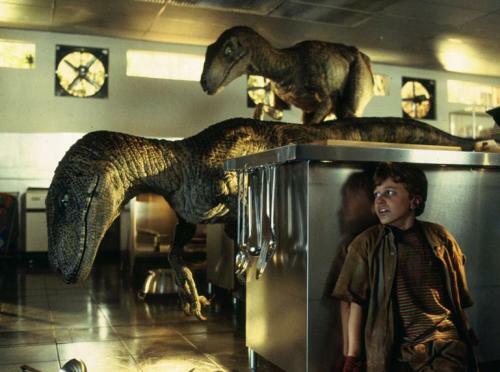 So much for the cruel velociraptor stereotype. The pair’s latest research focuses on the evolutionary patterns of those fearsome herbivores. “The research that [we] did was to use dinosaurs to investigate the bigger evolutionary question of how animals become herbivorous,” said Makovicky. Scientists had hypothesized that as species’ evolved to become plant-eaters, their body mass would also grow. Big vegetarians not ringing a bell? Step away from America’s next top vegetarian model and instead imagine an elephant, or a brachiosaurus, or a snuffaluffagus (not totally real, but still a relevant example). The broad theory about evolutionary mass and herbivory says that the bigger some herbivores get, the easier it is to take in all those leafy greens. To find out that such evidence didn’t exist, Makovicky and Zanno broke down the evolutionary trees of three different theropods who shifted to plant-based diets during the same time span, about 125 million to 65 million years ago. Evolutionary trees, or phlogenetic trees, are graphs that show the relationships scientists infer between evolving species over a period of time. When Makovicky and Zanno analyzed the trees of their chosen theropods, they found that some of the bird-like giants got bigger, others smaller over different periods. “They don’t look anything like your traditional view of a dinosaur,” he said. 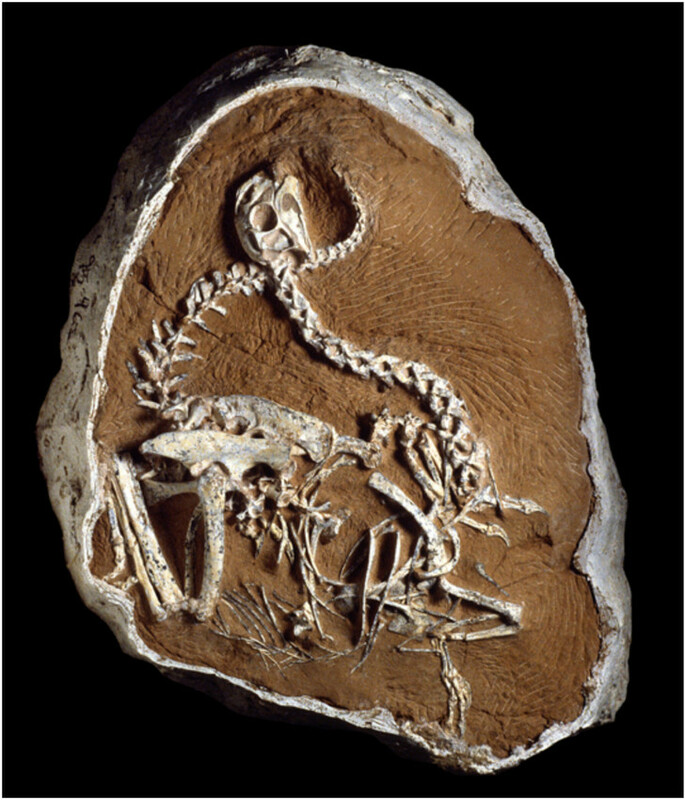 The egg-thieves (oviraptorosaurs) are often depicted sitting on nests. They had a beak with a sliding jaw joint and a parrot-like head, sometimes with a bulge on top. The scythe-lizards (therizinosaurs) were toothless, with a small head atop a long neck and squat body. Unlike the massive flamingos you might be picturing, though, they had thick limbs. 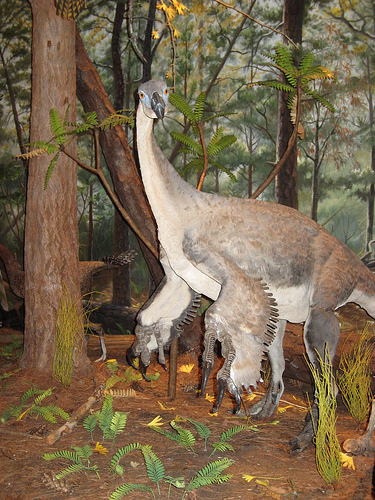 And the ostrich-mimics (ornithomimosaurs) have a name that speaks for itself. Think of them as the giant chickens of the Cretaceous age. All of these lizardly curios had feathers and are thought to be close relatives of current-day birds, and they lived in China, Mongolia, and what is now western North America. Makovicky and Zanno conducted three tests based on the three theropod species, which they selected because all became herbivores during the Cretaceous period. But when Zanno and Makovicky did a second test in which they broke down the evolutionary trees of each species and studied the branches of the trees, some of the branches got bigger while others got smaller at different times. That made it seem far less likely that any overall growth was consistently linked to the transition to herbivory. In their third test, they focused on two theropod lineages that occurred over the same period and in a similar location. That allowed the researchers to observe that the changes in size over time track each other, meaning that when one of the species got smaller, so did the other. The logical conclusion from this observation was that some environmental factor experienced by both species was more important than diet in determining the evolutionary direction of their sizes. Bigger is not always better. But why? What would make a recent convert to vegetarianism benefit from shrinking? Makovicky and Zanno’s research can’t say for sure. Competition with other dinosaurs could be a factor. For herbivores living around a slew of other herbivore species, there could be advantages to focusing on a specialized dietary niche that larger feathered friends couldn’t access. Makovicky also said smaller animals tend to reach maturity and reproduce at earlier ages. When the creatures ended up in environments with less abundant resources, evolving to smaller sizes could have been a way to stabilize the population. The simultaneous changes in multiple species from one environment could also result from the nature of the geologic record. “You might have [geologic] environments that preferentially preserve small things,” said Makovicky. The ups and downs in size could reflect shifts in what was mostly likely to be preserved, rather than in the actual sizes of the creatures. The layman’s take-away from Makovicky and Zanno’s research is probably still the Big Bird bottom line: these theropods were huge, and they tended to get ginormous. Some of the biggest specimens were found right at the end of the Cretaceous, which was the era of big dinosaurs in general: “Everything got bigger,” Makovicky said. The environment for everyone - right up until that pesky extinction problem made the news - seems to have turned body mass into an asset. The reason for that grand trend is one of the big questions dino experts are still struggling to answer.